Description: Heading west towards Aldene. What appears to be smog in the distance is auctually the cloud of debris from the WTC attaacks just days before. The reality of it all never set in until I took this shot on Friday September 14th, 2001. Description: An F40PH-2CAT sits by the sand tower ready to head up to Long Branch. A New Jersey Transit hack sits in the yard. Description: Idling in the terminal with a string of arrows. Description: NJT F40PH-2CAT #4116 speeds past "my favorite spot" on the Bergen County Line. Old piles or railraod ties are where I stood to take this photo now. 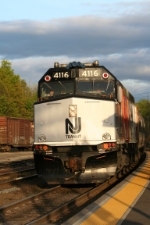 Description: A rare find of two NJT units double heading. Description: I got a tip off earlier in the morning about this set, 5002-6-4116 10:29 AM. Note the train ENTIRELY consists of ALL Comet III's, a rarity for the Raritan Valley Line! Description: 5431 with the legendary short lived all Comet III consist passes Boyd Tower. Description: 5431 with the legendary short lived all Comet III consist. Description: F40s still run out this way. Description: NJ Transit F40PH-2CAT #4116 waits outside the Hoboken Terminal on track 1. Description: NJT and MNCR F40PH-2's populate the loco yard at the MMC. Description: On the Montclair-Boonton Line. Description: Six of the seven stored New Jersey Transit locomotives stored at Bay Head Yard. Description: NJ Transit F40PH-2CAT #4116 leads a rush hour commuter train into the station in Red Bank NJ. Description: A closeup of NJ Transit F40PH-2CAT #4116. Description: A pair of F40's lay over during the Memorial Day weekend at Port Morris. Description: NJT F40PH-2CAT 4116 shoves a couple camaros and a Comet I past the employee stop at Port Morris yard. Description: Yet another train smokes it up in Ho-Ho-Kus.